Are you tired of aching, sore knees that hurt every time you stand up? Have you stopped playing sports because you just can't bear the pain it causes? Are you frustrated with hours of failed physical therapy? Do you feel like you are at your wits end, with no sign of finding a solution? Patella Femoral Solutions is the answer to treating your knee pain. My name is Barton Anderson and I am a certified athletic trainer. Over the last 14 years I have treated countless patients, just like you, who were suffering from patella femoral syndrome. Every single one of my patients saw improvement with their knee pain - most were able to return to sports completely pain free. This isn't just another knee strengthening program. Chances are you have already been through the traditional treatment program and it didn't work. You won't find any ordinary leg lifts, or knee extensions. No ball squats or quad sets. The simple truth is that these exercises don't work to eliminate your knee pain. In fact, they often make it worse. If I told you that the key to fixing your knee was in strengthening your hips, you might think I was crazy. Most people do at first, until their knee pain starts to go away. The patella sits in the femoral groove - this creates the patella femoral joint. When you bend and straighten your knee, the patella moves up and down in the groove. If you are suffering from patella femoral syndrome, your patella is not aligning correctly. That causes your pain and aches, and keeps you from doing what you enjoy. The problem with the standard treatments is that it focuses on strengthening the VMO. The idea is that improved strength of the quadriceps will help to realign the patella. The reality is that the patella isn't the real problem. The way the patella aligns in the groove is directly dependent upon the position of the groove. If the femur is in a poor position, the patella has no choice but to follow along and be mis-aligned. If your femur moves into positions it shouldn't be in, the patella will too. There are 4 muscles that attach to the patella. There are 22 that attach to the femur! Would you rather spend your time strengthening four muscles that have very little to do with the patellar alignment, or work on improving the 22 muscles of the hip that will fix your knee pain once and for all? Most people DO think I am crazy when their treatments focus on improving their hip strength and mobility. That is until their knees feel better and they can walk up the stairs and play sports without pain. Imagine what it would be like to not have knee pain anymore - it is possible. Patella Femoral Solutions is a complete program that will walk you step by step through 21 exercises proven to eliminate knee pain caused by patella femoral syndrome. It contains the best exercises to treat patella femoral syndrome. Each exercise has been tested and proven on hundreds of patients just like you. Patella Femoral Solutions is divided into 4 levels, with each level building upon the previous as your body gets stronger. These are the same exercises I use with my own patients and I know they work. The entire program requires very little equipment, so you don't have to make any huge investments or gym memberships. That also means you can do it in the comfort of your own home, saving time and gas driving to a rehabilitation clinic or gym. Best of all, patella femoral solutions will give you back your life and the freedom to do the things you love. No more frustation, soreness, or pain. Think about how many doctors visits you have had and how many hours you have spent in physical therapy. Isn't it time to finally get to the bottom of the problem and find a solution that doesn't involve medications, injections, braces, or surgery? I'm a 38-yr old female and I've been a recreational runner (less than 20 miles a week) for the past 17 years. I was diagnosed with runner's knee on my right knee (my 1st major injury) in December. I realized I developed it because I pushed my body to run a 10k race without enough training time as well as not having a well rounded workout program. Unfortunately a few months later my left knee started to hurt as well. Once I went through the denial stage I promptly saw a sports therapist who ordered an xray and recommended daily VMO strengthening exercises (ball squeeze, straight leg lifts, towel smash). To keep my fitness level up I also cross-trained on the elliptical, lifted weights, and practiced yoga. It was a very slow and often times frustrating process on the road back to recovery. At the end of each month I would re-evaluate whether I could run again and each time my knees did not feel quite ready. Therefore, I would feverishly research on-line to find a "solution" to my runner's knee injury. I found sites that recommended knee rehab (pilates type) exercises. Other sites emphasized posterior moves because runners are typically quad dominant. Therefore, I incorporated all of my findings into my workout program. All the while I faithfully kept up with the recommended daily VMO exercises. However, although I understood it would take time, I just felt like there had to be more to healing my runner's knee injuries besides the VMO exercises. Finally after 5 months since being diagnosed with runner's knee I stumbled upon your website and article "Does Strengthening the VMO Help With Patella Femoral Syndrome?" After reading it I immediately knew I had to purchase your ebook Patella Femoral Solutions... I was not disappointed. I've seen lot of knee rehab exercise suggestions and I was plesantly surprised that a lot of the exercises in the ebook I'd never seen before. As a result, I immediately stopped my VMO exercises and promptly started the Patella Femoral Solutions exercise program. As I progressed with the program, I noticed a signifcant improvement in my knee pain. Finally, 5 weeks after starting the Patella Femoral Solutions program I felt both knees were ready and I went for a slow jog/walk. Four weeks later I'm up to 30 minutes of running with no knee pain. I wish I had stumbled upon your website and purchased your ebook earlier as I probably would've been on a faster road to recovery. I cannot emphasize how much your guidance has helped me because I do not believe I would have been able to put together my own effective rehab program without your help. It was meant to be that I stumbled across Sports Injury Info because I was at my wit's end performing the daily VMO strengthening exercises and really frustrated with my slow healing process. You have inspired and motivated me to revamp my workout routine and pull me out of the workout rut I was in. I still cannot believe that it's been 7 months since I got diagnosed with runner's knee and I'm finally outside running again. Bart, you have given me the knowledge and confidence that I can continue running for a long long time. To me this is priceless. I developed Patella Femoral Solutions for anyone suffering from anterior knee pain. If you have been suffering from patella femoral syndrome, you can benefit from this program. If you have been through traditional therapy with little or no success, its time for a change and to try again. If you have considered surgery, such as a lateral release, this could be your key to avoiding it. If you are sick and tired of knee pain, this book is for you. For less than the cost of dinner for two, you can have pain free knees. You can return to a normal life and not have to worry about when your knees will start hurting again. Can you trust me with your PFS recovery?? If you have been searching for solutions to your knee pain, you have probably found a lot of information on the internet claiming to do everything I have discussed above. So why should you trust me with your sports injury? Patella Femoral Solutions is the second ebook in the "Solutions" series. Since October of 2008, I have provided rehabilitation guidance to hundreds of people, just like you, who suffered from patella femoral syndrome. I know the exercises in Patella Femoral Solutions can successfully eliminate your knee pain and return you safely and quickly to your sports activities and a pain free life. I have had patella femoral pain since I was 16, that was 9 years ago. I was in excellent shape, I played every sport there was, (rugby, soccer, rock-climbing, swimming...) but the pain got worse and worse and I had to stop almost all of the sports. I tried everything to get rid of my knee pain. I've been to orthopedic surgeons and physical therapists in NY, MA, and MN (at the mayo clinic), I've spent $1000 to get out of out-of-coverage doctors to do CT scans, MRI's and cortisone injections. I've done bio-feedback, electrical simulation, I can name every exercise that a PT would prescribe for patella femoral solutions, I read research articles on the subject. No doctor could find a problem, an no physical therapist could find a solution, so every doctor just sent me to another physical therapist and every PT sent me to another doctor or gave up on me. I found your Patella Femoral Solutions program on the internet, and as an engineering graduate student it took me a while to try something that sounded so gimmicky. But I've been on the program for 3 months and I've noticed a dramatic improvement in my leg strength (I'm just moving from level 3 to level 4 in the booklet). I was thinking about it today when I went for a bike ride. So thank you. I am extremely grateful for what you've done for me. Hopefully my knee will continue to improve. I will let you know when I start hiking and climbing and maybe even running. I am so confident that this program will provide you with everything you need for a full recovery, if after trying Patella Femoral Solutions you are not completely satisfied, I will refund your entire purchase price, no questions asked. You have nothing to lose but time - Download your copy of Patella Femoral Solutions today, read through the program, and start using these cutting edge exercises to eliminate your knee pain. It is time to put an end to your frustration and pain. No one should have to go through life avoiding the things they enjoy. You shouldn't be sidelined from your favorite sports, or recreational activities. You can be pain free in a matter of weeks, all you need is the right program and a little guidance. Think about how much time you have already spent trying to find a solution for your knee pain. Now it is time to start your recovery. An instantly downloadable e-book with over 45 pages of exercise information. The four best exercises for improving mobility in all the right places. 17 strengthening and balance exercises that will eliminate your knee pain and give you a much stronger and stable body. Thats right. I am positive that Patella Femoral Solutions will help to reduce or eliminate your knee pain. So positive that I will gladly refund your entire purchase price at any time within the next year if you are not completely satisfied with your purchase. Absolutely no questions asked. With your purchase of Patella Femoral Solutions you will also receive one on one customer support - so if you have specific questions about the ebook or don't quite understand an exercise, I am only an email away. Where else can you get a complete program of exercises proven to eliminate knee pain caused by patella femoral syndrome for less than $25? This will open your shopping cart with Patella Femoral Solutions. Click on the yellow PayPal button to check out. You will be taken to a secure payment page and will be able to complete your order. You can pay using your PayPal account or credit card. Once your payment is complete, you will be redirected to the secure download page. If you are not re-directed, click on the orange "Complete Your Purchase" button on the payment page. You will also receive an email confirmation with your download link, with the subject line "Patella Femoral Solutions Purchase from Sports Injury Info". Patella Femoral Solutions is only available as a downloadable ebook. No physical product will be shipped to you. Downloadable ebooks allow me to offer this comprehensive program at this low price because I do not have to account for printing and shipping charges - so everyone saves! It also means that you will have instant access to the information - no waiting for a hard copy book to arrive. You can start the program in just minutes! 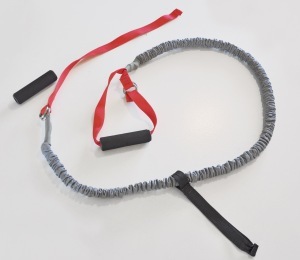 This high quality exercise band was specially designed just for the Solution Series exercise programs. You won't find a more versatile or durable elastic band anywhere else. You may be thinking to yourself "Can this guy be for real?" Many of my patients have asked the same thing...until their knee pain went away. You may have tried other programs, seen the physical therapists, doctors, and specialists - and yet you still have knee pain. This could be the solution you have been looking for - the only way to know for sure is to give it a try. Traditional PFS programs focus on strengthening the quads and muscles that attach to the patella. For the last 2 decades, this has been the standard treatment for anterior knee pain, with mixed results. But there is a better, more successful approach...to strengthen the hips, and core. Stop spinning your wheels and wasting your time with exercise programs that don't make you better. Since 2008 when Patella Femoral Solutions was first published, hundreds have used the program to eliminate their knee pain. They made the choice to stop letting pain rule their lives. They took control of their recovery. You can do the same. Try Patella Femoral Solutions today. Go ahead, download your copy - try the exercises, work through the program. 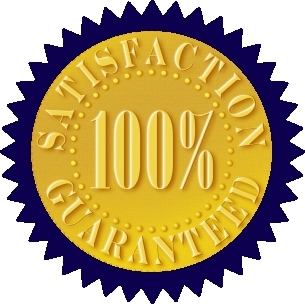 If, after you give the program a chance, you are not completely satisfied, send me an email, or use the contact form on the site, and I will gladly refund your entire purchase price - with absolutely no questions asked. I developed this program to help people like you free themselves from the frustration and pain of patella femoral syndrome. I have seen countless patients find success with these exercises, after months or years of failure with traditional vmo strengthening rehab. But you can't benefit from the program unless you try it. How much is a pain free knee worth to you? Download Your Patella Femoral Solutions Today!